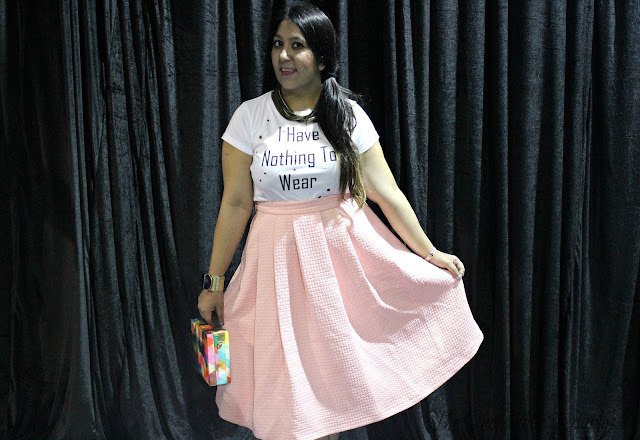 OOTD - I Have Nothing To Wear | How to Style a Voluminous Skirt | Curvy Style Guide | The Shopaholic Diaries - Indian Fashion, Shopping and Lifestyle Blog ! Hope you all are doing well and enjoying the Cricket season. I am really excited to watch the WT20 Semi-final tonight and really hoping that we reach the finals and get the trophy. 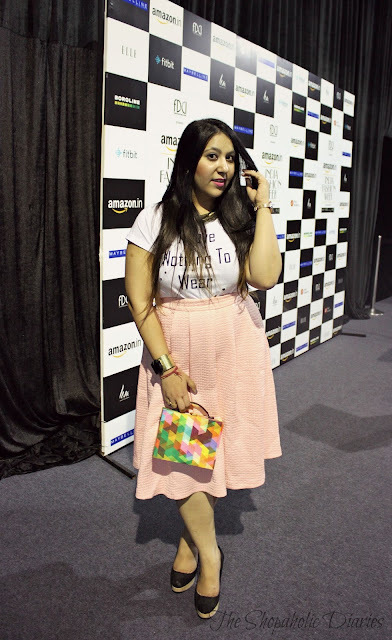 Well, I am back with an Outfit post - one of the outfits that I wore to the recently held Amazon India Fashion Week. Fashion Weeks are really crazy and confusing when it comes to dressing up, as all everyone can think of (even more than looking at the designers' collections) is to stand out of the crowd, even if that makes them look wacky and outrageous. But even in this battle of Best Street Style, I always tend to dress up casually and comfortably - that reflects my personal style. 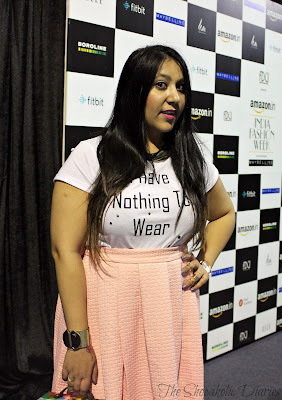 During this season of AIFW, I woke up one fine day and realized I had really nothing to wear ( I know all of us face this atleast 3-4 times a week :D). I had really wanted to wear this beautiful voluminous skirt from Marks and Spencer which had been lying unused in my closet since last one year. So I tried a dozen of tops with it before I picked this tee with fringes from Spring Break and tucked it in and thought it looked decent enough with the skirt. I completed the look with a chic, colorful box clutch from Virtue Lady, multi-layered neckpiece and wedges from Forever 21. A full skirt has to be the center of attention in any outfit because of its volume. Pair it with a solid colored top or tee and complimenting accessories to highlight the bouncy style of the skirt. If you love experimenting, you can pair a printed skirt with a minimal print on top or a graphic tee like mine that will give you a trendy look. Pair it with a crop top, baring just a hint of skin, giving you a toned-down look. Do you like wearing Full or voluminous skirts too? Let me know your views on this outfit in the Comments below. Hi. 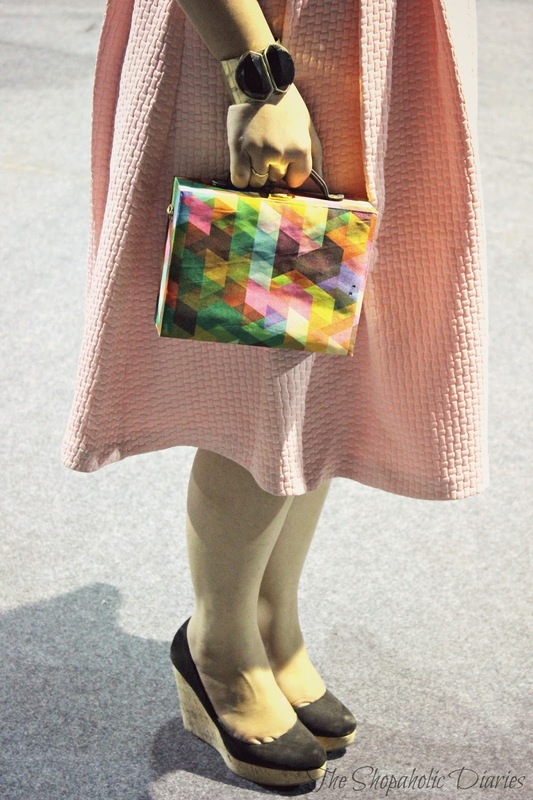 Could you please share the link/store address from where you bought the bag? Absolutely loved that one! Hey!Loved your blog. Next time you feel like shopping, why don't you visit www.dealhopp.com to find amazingly good deals on women apparels and accessories!